Deeply in the subsoil of the old manor house “hotel in the pleasure garden” Roman farmer’s Estonian and channels of an antique water pipe from zeit came to light because about 150 A.D., as “Ladenburg” still Lopodunum was called and was as a Roman’s town a blossoming centre of the lower Neckar country. Also a mighty pillar discovered in 1973 under the current garden café kapitell which presumably comes from the obvious king’s court of the Merovingian’s time (6./7 cent.) proves that this house is based proverbially on the ground of the tradition. Since about 1200 the medieval town received her second connection ring, lay at this point where the military wall following from the Tower with mighty discharge curves made a sharp crease after the south, a square tower with merlons. Even today one sees close beside the hotel and even in his guest room with the entrance impressive rests of this connection. Under the current hotel old cellars still refer to a stately house arrangement of this period which must have originated after the staufischen shards discovered there on the cellar ground already more than 750 years ago. Who sees today the nicely jointed baroque construction close beside the entrance in the former bishop’s court, has the court established about 1720 of the barons of Otto before eyes. This originally from Ulm coming württembergische gender had been lifted in 1569 by emperor Maximilian in the nobility and took over after the extract of the Wormser bishops from store castle, the management of the bishop’s court become Palatine now. If the famous former episcopal pleasure garden also belonging to it, so that the nobility court was called in the vernacular in short the pleasure garden – today “Hotel im Lustgarten”. In the Ladenburger advice protocols of 1725 is from the unconventional Mrs. Geheimrätin von Otto the speech. For theirs close to the south of the court wanted to pay to situated Wingert of the town simply no taxes and for necessary did not hold to close the pleasure garden gate standing still at that time beside the court at night. On old views this mentioned gate is reinforced as a stately connection by two flank pileworks and is shown with a drawbridge about the town ditch equipped. 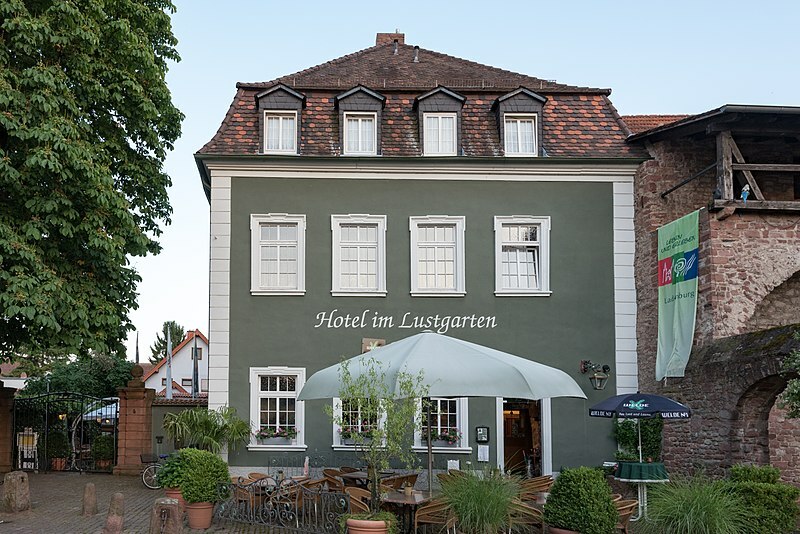 When the today’s house-owners, family “Katzenmaier”, after thorough rebuilding opened here in 1973 the “Hotel im Lustgarten”, they consciously went back to the old tradition of this house: The best from the past and excellently recreated have had in Ladenburg always her place.